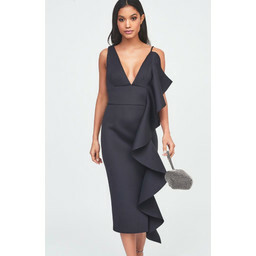 The Lavish Alice Draped Frill Midi Dress is a statement piece with a plunging v-neckline and a large frill that cascades elegantly down the dress. The dress is sleeveless with asymmetric straps, and has a low back with a concealed zip to fasten. The scuba fabric provides a snug but flattering fit - the perfect piece for this party season!